Is this perception merely anecdotal—or is it a recent and measurable trend in U.S. politics? If so, what are its ramifications? For starters, anger is not new. In the context of the 2004 presidential contest between George W. Bush and John Kerry, American National Election Studies asked voters about their feelings toward the candidates. Sixty percent of Democrats said they were “often” or “fairly often” angry at Bush, while only 30 percent of Republicans were angry at Kerry. Does that mean liberals are more misanthropic that conservatives? Not entirely. In 2012, the level of ill-will expressed by political partisans toward the man in the White House was nearly reversed: 59 percent of Republicans were angry at President Obama, while only 44 percent of Democrats were angry at Mitt Romney. Although the variable was which party occupied the White House, one constant was present in both surveys: The stronger one’s partisan views, the higher the anger levels. The landscape now is different. In 2016, we have two non-incumbent candidates running for president, albeit candidates who are remarkably unpopular. In August, YouGov polled 1,500 Americans about anger and politics. Some of our questions overlapped with a January 2016 Esquire/NBC survey on “American Rage.” Both surveys found that alarmingly large numbers of Americans read or hear something in the news that makes them angry at least once a day. Esquire/NBC found 67 percent (31 percent a few times a day and 37 percent once a day) while YouGov found 54 percent angry at least once a day (26 and 28 percent, respectively). Who are all these angry people, and how will their ire translate into voting behavior in the 2016 election? As we have seen, partisans of the out-of-power party are generally angrier than those of the party that controls the executive branch. Our data bear that out, as 52 percent of Democrats are angry once a day or more while 61 percent of Republicans meet this standard. Moreover, of self-described strong Republicans, 74 percent were mad once a day or more, and among their strong Democratic counterparts, 60 percent were angry at least once a day. 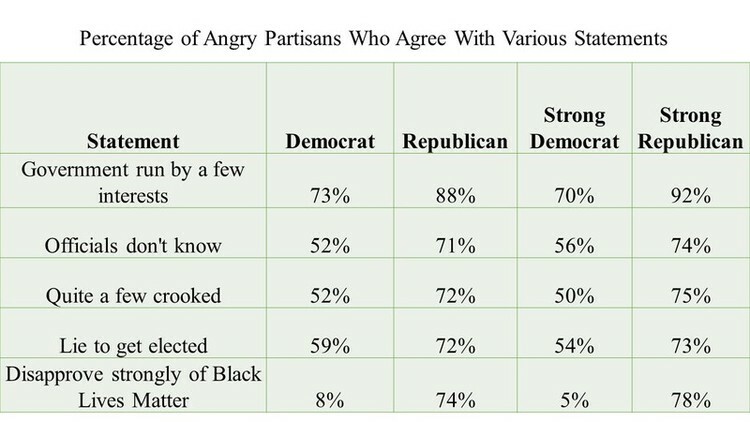 Only 42 percent of weaker Democrats were angry once a day or more, while weaker Republicans were at 60 percent. In short, Republicans are—for now, anyway—more ticked off than Democrats, and stronger partisans in both parties are the most peeved. Other research has shown that those who perceive themselves as worse off economically tend to be angrier. We found this, too: 60 percent of respondents who are doing worse financially than they were five years ago place themselves in the angry category. Seventy-five percent of Republicans who said they were much worse off financially were angry, and 81 percent strong Republicans who were much worse off economically were angry. This was decidedly not true for strong Democrats: Only 28 percent of them in the worse-off economic category were angry. This suggests a racial component to anger, and drilling down more deeply we find that among strong white Republicans who were either somewhat or much worse off, 90 percent were angry. In other words, the myth of the “angry white male” is no myth at all. So how do race, perceived economic situation, and partisanship stack up on issues and voting in 2016? Turning to the candidates and the election, we asked our sample how “likable” they find Trump and Clinton. We found, unsurprisingly, that partisanship dominates such views. Of strong angry Republicans who said they were worse off, 98 percent said they did not like Clinton. In contrast, of strong angry Democrats who were worse off over the past five years, only 15 percent disliked her, while among strong angry Democrats who were better off only 1 percent disliked her. Trump’s likability among Democrats was less tethered to the respondents’ personal finances than to their level of anger. More than 80 percent of Democrats dislike the guy, no matter what category they’re in. A crucial source of Trump’s primary support came from white males who were worse off. Also, in our poll, white males who were angry and Republican liked Trump at 90 percent, a sharp contrast to Trump’s overall 38 percent likable score for the entire sample. In regard to voting, angry white Republican males who are worse off are Trump’s staunchest voters at 94 percent. Democratic anger is apparently having little effect on voting preferences as angry Democrats supported Clinton over Trump by 9 to 1, while the less angry supported her over him at more than 15 to 1. In sum, anger in American politics has financial and racial roots, but partisanship dominates, and Democrats as the party in control over the last eight years are the targets of Republican ire.